Much of the richly diverse oeuvre of Albert Roussel (1869-1937) grew from his far-flung travels as a young navy officer. One of the major French composers of his time, he produced music that embraces the exotic colours of so-called Impressionism, the rigour of his training at Vincent d’Indy’s Schola Cantorum, and the questing spirit of Modernism. Containing a number of CD premieres, this wide-ranging edition features such performers as Jean Martinon, Charles Munch and Claire Croiza – all colleagues of the composer, who makes appearances as both conductor and pianist – André Cluytens, Michel Plasson and José van Dam. 2019 marks the 150th anniversary of the birth of Albert Roussel (b. 5 April 1869), one of the major French composers of the early 20th century. Roussel was born into a wealthy family in northern France and became an orphan at the age of eight. His early career was in the navy and it took him to South East Asia. This exposure to different cultures proved of decisive importance to his subsequent work as a composer. In 1894 he left the navy and devoted himself to a career in music. From 1898 to 1907 he studied at the Schola Cantorum conservatory, founded in 1894 by the composer Vincent d’Indy. He also taught counterpoint at the Schola Cantorum, where his pupils included the composers Erik Satie and Edgard Varèse. One of his private pupils was Jean Martinon, who became a noted conductor of his music. Roussel soon began to enjoy success as a composer. In 1909, he and his wife made a trip to India. This inspired his Evocations for orchestra and voices and his opera-ballet Padmâvatî. Roussel’s music is wide-ranging in its ambitions and forms, embracing a diversity of orchestral works (including symphonies, concertos and ballet scores), an opera, choral works, chamber music, solo piano music and songs. Among his earlier works, the best known is the intricate, colourful ballet score Le Festin de l'araignée (The Spider’s Banquet). Composed in 1912, it can broadly be considered an ‘Impressionist’ work. 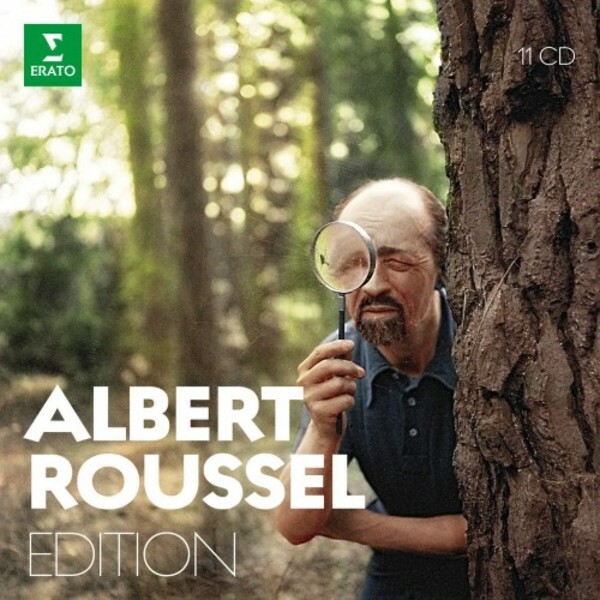 The 11 CDs in the Albert Roussel Edition provide a comprehensive survey of Roussel’s rich and varied output in recordings made between 1927 and 1990. In a recording from 1929, Roussel himself conducts excerpts from Le Festin de l'araignée (the set also includes recordings of him playing the piano and speaking), while his sometime pupil Jean Martinon conducts the entire ballet score in a recording from 1971. Conductor Charles Munch and mezzo-soprano Claire Croiza, who both appear in the edition, were also closely associated with the composer. A number of recordings in the edition are appearing on CD globally for the first time. The analogue recordings in the edition have been digitally remastered in 24bit/96kHz from the original tapes by Art & Son Studio, Annecy (also responsible for the remasterings of Warner Classics’ Menuhin, Rostropovich and Cluytens editions).